You are here: Home / Breeds / Pure / Miniature Dachshund vs Standard – Is One Better Than the Other? 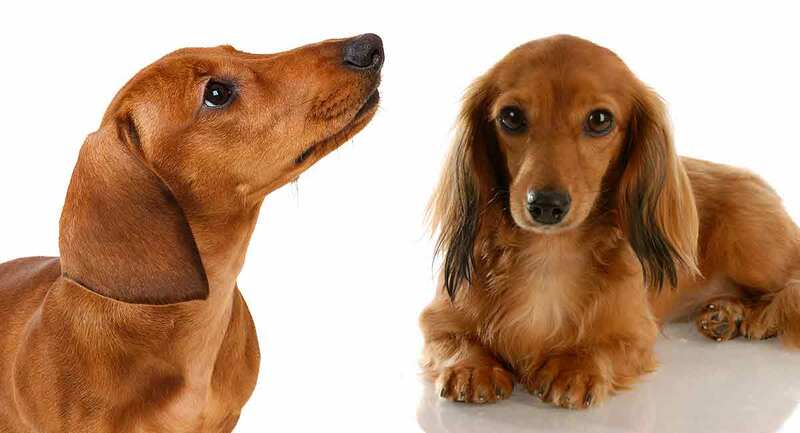 The distinctive long body and short legs of the Dachshund make him one of the world’s most recognized breeds, but which is better: miniature Dachshund vs standard? Known as the little dog with a big personality, the Dachshund can be standard-sized or miniature. Both sizes also come in three coat types: smooth, wirehaired, and longhaired. In this article we’ll find out if size is the only difference between the miniature and standard Dachshund. We’ll also look at their history, temperament, and health concerns to help you make an informed decision about bringing a miniature or standard Dachshund into your life. The Dachshund’s history began in Germany some 600 years ago. This is a fitting name for a dog whose long low body was precisely designed for the purpose of digging into badger dens. Miniature Dachshunds were ideal for hunting smaller prey like rabbits. Originally they were probably the result of crossing a standard Dachshund with toy terriers or pinschers. Over time, crossbreeding was abandoned and today’s miniature Dachshund is the outcome of breeding smaller than average standard Dachshunds. Although the standard Dachshund is quite a small dog, they’re still considerably larger than the miniature version of the breed. The standard Dachshund stands between 8 and 9 inches, while the miniature Dachshund is only 5 to 6 inches. Weight is significantly more disparate between the two. The standard Dachshund weighs between 16 and 32 pounds. The diminutive mini Doxie weighs under 11 pounds. All Dachshunds have very short legs in relation to a very long, muscular body. Unfortunately, this creates real problems for the breed, which we’ll look into shortly. Both versions have a long, tapering muzzle, round dark eyes, and round, floppy ears. Dachshunds come in a wide array of colors including red, cream, black, chocolate, wild boar, gray, and fawn. The patterns found in any sized Dachshund are dapple, brindle, and piebald. The biggest difference in appearance is between the different coat varieties. The smooth Dachshund, with his short, shiny coat, is the most popular. The wirehaired Dachshund has a short, thick, rough, hard coat, with the added distinctive facial features of a beard and eyebrows. The longhaired Dachshund’s coat is sleek, slightly wavy, and longer on the ears, under the neck, on the forechest, under the body, and behind the legs. There doesn’t seem to be any real temperament difference between the miniature and standard Dachshund. Spunky, vivacious, courageous, clever, and lively, regardless of their size, the Dachshund can make a loyal and entertaining companion. It’s actually coat type that appears to have some bearing on personality for the miniature and standard Dachshund. The wirehaired Dachshund has a reputation for being more mischievous and tenacious, while the longhaired Dachshund is more easygoing. Their predisposition to hunt has left the Dachshund with an independent streak that can lead toward stubbornness and an instinct to chase small animals and children. Since they were bred to hunt underground, they needed a sharp and persistent bark to let their owner know their location. Their tendency to bark makes them excellent watchdogs, but they can be quite loud. This study found Dachshunds to be aggressive toward both humans and other dogs. Despite an innate intelligence, both the miniature and standard Dachshund can be a handful to train. Their independence and stubbornness is best tempered with a positive reward-based style of training. This sensitive dog will not take well to harsh words or punishment. As with any breed, socialization with a variety of people, places, and pets has the best results if started early. Dachshunds are known to be difficult to potty train. If you consider that a miniature Dachshund puppy weighs just 2 or 3 pounds, you can imagine how small their bladder is. Get them in the habit of going to their potty spot immediately after eating. Crate training can be an effective tool, as they won’t want to pee or poop in their own space. At one time, the Dachshund was a very active and robust breed. Today, their long back and short legs are unnaturally exaggerated, and this causes the breed real health problems. Regular exercise is important for a dog that’s prone to becoming overweight. They need to have strong muscles in order to protect their back from serious injury. The UK Dachshund Breed Council recommends exercising a puppy 5 minutes per day per month of age. This means that at 6 months they should be going for a 30-minute walk each day and up to 45 minutes as an adult. Miniature and standard Dachshunds have a lifespan of 12 to 16 years. Like all purebred dogs breeds, they are prone to certain health conditions. However, the biggest health concern for the Dachshund is their body conformation. Over the years, their iconic shape has extended far outside its original purpose. This has created real problems for the Dachshund breed in the form of intervertebral disc disease (IVDD). Intervertebral disc disease occurs when the material inside a disc protrudes into the spinal column. This causes pain, nerve damage, and in severe cases, paralysis. Due to their long backs, roughly one out of every four Dachshunds suffers from the painful effects of IVDD—and 10 to 12 times more often than any other breed. When comparing all six types of Dachshund, this 2015 study found the standard smooth Dachshund was over three times more at risk for IVDD than the standard wirehaired Dachshund, who had the lowest prevalence of the disease among Dachshunds. An inactive lifestyle and age were also factors in acquiring IVDD. Like many small dogs, the Dachshund is prone to obesity, and carrying extra weight can greatly exasperate back problems. According to this study, dogs have been shown to gain weight along their lumbar spine more rapidly than other areas. Dachshunds can suffer from inherited eye problems, including dry eye syndrome, cataracts, and glaucoma. The most serious is Progressive Retinal Atrophy (PRA), a degenerative eye disease that can lead to blindness. Unfortunately, there are few detectable symptoms and no treatment, but health tests are available to ensure the condition isn’t passed along. Studies have found both the longhaired miniature Dachshund and the wirehaired standard Dachshund to be affected by early onset vision impairment. Lafora disease is a fatal form of late onset, progressive epilepsy caused by a gene mutation. It leads to seizures, dementia, and paralysis. A high prevalence of this inherited disease is found in the miniature wirehaired Dachshund. Health testing is available, and all responsible breeders will have proof that their breeding stock has been tested. Imagine that the miniature and standard Dachshund came with handle-with-care stickers. Due to their high susceptibility to serious back problems, they should only be lifted at the chest and back end simultaneously. Whenever you’re out for a walk they’ll need to be lifted over any obstacles. They should never run up and down the stairs or jump on or off of furniture. If they’re around children or other dogs, monitor them to avoid injury to their backs. The miniature and standard Dachshund are moderate shedders, and grooming requirements will vary depending on coat type. The smooth Dachshund is very low maintenance. You only need to wipe him with a damp cloth and brush him once a week to keep his coat looking shiny. The longhaired Dachshund requires daily brushing to remove tangles and mats from his longer, flowing coat. You should brush a wirehaired Dachshund a few times a week and hand-strip several times a year. The beard and eyebrows require occasional trimming. All Dachshunds should have their nails clipped monthly. As their ears can be prone to infection, they also require regular cleaning. It’s important to feed a miniature or standard Dachshund a good quality age-appropriate food. Not carrying any excess weight is vital, not only for general health concerns, but to avoid making spinal problems worse. With the severe structural defects associated with the miniature and standard Dachshund, we strongly recommend considering rescuing an older dog instead of buying a puppy. As long as people keep paying for dogs bred with a disability, breeders will continue the practice to the detriment of a helpless animal. There are many Dachshunds of all ages living in shelters looking for a forever home. I need pictures of them next to each other. I don’t think these are real.